i) 5 years for SC/ ST/BC ii) For 5 years if a candidate is an employee of A.P. State Government (Employees of APTRANSCO, Discoms, APGENCO, APSRTC, Corporations, Municipalities, Local bodies etc. are not entitled for age relaxation). iv) 3 years in addition to the length of service rendered as a whole time Cadet Corps Instructor in NCC provided the candidate rendered a minimum service of 6 months as a whole time Cadet Corps Instructor in NCC. v) 3 years if a candidate is a retrenched temporary employee in the State Census Department with a minimum service of 6 months during 1991. III. Minimum Educational Qualification: The candidate must hold a Degree awarded by any University in India, established or incorporated by or under a Central Act, Provisional Act of State or of any institution recognised by the University Grants Commission or any other equivalent qualification. In the case of a candidate belonging to Scheduled Castes or Scheduled Tribes, as on 1st July, 2011, he/she must have passed Intermediate or any other examination recognised by the State Government as being equivalent to Intermediate and should have studied Degree. (Civil)(Men) in Police Department Height: Must not be less than 167.6 cms. Chest: Must not be less than 86.3 cms round the chest on full inspiration with a minimum expansion of 5 cms. (AR) (Men) in Police Department Height: Must not be less than 167.6 cms. (SAR CPL) (Men) in Police Department Height: Must not be less than 167.6 cms. (APSP) (Men) in Police Department Height: Must not be less than 167.6 cms. (APSP) (Men) in 15th Bn., APSP in Police Department Height: Must not be less than 167.6 cms. Department Height: Must not be less than 167.6 cms. * Height: Must not be less than 160 cms. b) Each eye must have a full field of vision. c) Colour blindness, squint or any morbid condition of the eye or lids of either eye shall be deemed to be a disqualification. B) The candidate should possess sound health and be free from any bodily defect or infirmity which will render him unfit for police service. Andhra Pradesh Police Sub-Inspector Exam will consists of Preliminary Selection Test, Physical Efficiency Test (PET) and Written Examination. (Women) in Police Department Candidates will have to run 2.5 kms within 16 minutes. 02 Long jump 3.80 mtrs 3.65 mtrs. 03 Shot put (7.26 Kgs) 5.60 mtrs. 5.60 mtrs. Candidates in each event will be awarded maximum 25 marks. All the five (5) items put together will carry 125 marks. 02 Long jump 2.75 mtrs. 03 Shot put (4 Kgs) 4.50 mtrs. Questions in Papers III and IV will be objective in nature and will be set in English and Telugu languages. Candidates have to answer the questions on an OMR answer sheet using Blue / Black Ball Point pen only. For this purpose candidates should bring Blue / Black Ball Point pens along with them. Selection Procedure: Candidates will be selected based on their performance in Preliminary selection Test, Physical Efficiency Test (PET) and Written Examination. I. Preliminary Selection Test: In selection test, candidates have to run for 2.5 Kms within 16 minutes for Stipendiary Cadet Trainee Sub Inspectors of Police (Civil) (Women) in Police Department post and run for Five (5) kms with in 25 minutes for remaining all posts. II. Physical Efficiency Test (PET): The candidates who qualify in the preliminary selection test and who possess the minimum physical standards will required to under go the 100 meters run, Long jump, Short Put (7.26 Kgs/ 4 kgs), High jump, 800 metres run in the specified duration of time/ distance according to the desires post. III. Written Examination: Candidates who qualify in the Physical Efficiency Test will be required to appear for a written examination in four papers, each of three hours duration. Paper I for English, Paper II for Telugu, Paper III for Arithmetic and Test of Reasoning / Mental Ability (Objective in nature) and Paper IV for General Studies (Objective in nature). The minimum marks to be secured by a candidates in order to qualify in the written examination is 40% for OCs; 35% for BCs; and 30% for SCs/STs and Ex.Servicemen in each paper. Papers I and II are only qualifying in nature. The cases of the candidates who do not secure the minimum qualifying marks in these papers i.e., papers I and II will not be considered further in the selection process irrespective of their performance in papers III & IV. The marks secured in these papers i.e., papers I and II will not be taken into account for final selection. (i). 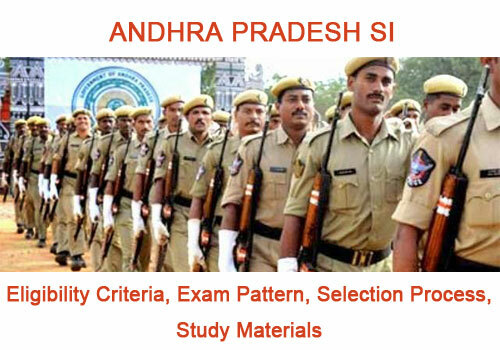 For Stipendiary Cadet Trainee (SCT) Sub Inspectors of Police (Civil) (Men & Women), Station Fire Officers in A.P. Fire & Emergency Services Department: The final selection will be strictly on relative merit of the candidates in each category, as obtained by them based on their score in the written examination out of a maximum of 400 marks (papers III and IV) and as per the provisions of “The Andhra Pradesh Public Employment (Organisation of Local cadres and regulation of direct recruitment) Order, 1975”. As per G.O. Ms. No. 124 General Administration (SPF.A) Dept., dated 07-03-2002 while filling up the vacancies, the first 30% of posts should be filled following combined merit list of locals and non-locals and thereafter, the remaining 70% of the posts shall be filled up by locals only. (ii). For Stipendiary Cadet Trainee Reserve Sub Inspectors of Police (AR) (Men) in Police Department: The final selection will be strictly on relative merit of the candidates in each category, as obtained by them based on their score out of a maximum of 325 marks in physical efficiency test (125 marks) and written examination (200 marks) (papers III and IV) and as per the provisions of “The Andhra Pradesh Public Employment (Organisation of Local cadres and regulation of direct recruitment) Order, 1975”. As per G.O. Ms. No. 124 General Administration (SPF.A) Dept., dated 07-03-2002 while filling up the vacancies, the first 30% of posts should be filled following combined merit list of locals and non-locals and thereafter, the remaining 70% of the posts shall be filled up by locals only. (iii). For Reserved Sub-Inspectors, Sub-Inspector in Special Protection Force Posts: The final selection will be strictly on relative merit of the candidates in each category, as obtained by them based on their score out of a maximum of 325 marks in physical efficiency test (125 marks) and written examination (200 marks) (papers III and IV). As per the provisions of “The Andhra Pradesh Public Employment (Organisation of Local cadres and regulation of direct recruitment) Order, 1975”, the rule of reservation to local candidates is not applicable. IV. Preference: When two or more candidates in a particular category obtain equal marks, preference will be given to the candidate who was born earlier. The candidate’s understanding of the English language, its correct usage and his writing ability would be tested. Questions on short essay, comprehension, précis, letter writing, paragraph writing / report writing, translation from English to Telugu etc. would be included. The candidate’s understanding of the Telugu language, its correct usage and his writing ability would be tested. Questions on short essay, comprehension, précis, letter writing, paragraph writing / report writing, translation from Telugu to English etc. would be included. Arithmetic: It will include questions on problems relating to number system, simple interest, compound interest, ratio & proportion, average, percentage, profit & loss, time & work, work & wages, time & distance, clocks & calendars, partnership, mensuration etc. Test of Reasoning: It will include questions of both verbal & non-verbal type and include question on analogies, similarities and differences, spatial visualisation, spatial orientation, problem solving, analysis, judgment, decision making, visual memory etc. 1. General Science – contemporary developments in science and technology and their implications including matters of everyday observation and experience, contemporary issues relating to protection of environment as may be expected of a well educated person who has not made a special study of any scientific discipline. 3. History of India – emphasis will be on broad general understanding of the subject in its social, economic, cultural and political aspects. Indian National Movement. 5. Indian Polity and Economy – including the Country’s political system, rural development, planning and economic reforms in India.